A leading Zimbabwean human rights activist was seized today by suspected secret police, in the most high level abduction operation yet by President Mugabe’s government. Fifteen armed men in civilian clothing burst into the home of Jestina Mukoko, the executive director of the Zimbabwe Peace Project, in the small town of Norton 40km west of Harare at 5am, lawyers said. “They assaulted her caretaker and took her away,” said Abel Chikomo of the Zimbabwe Human Rights NGO Forum. Her teenage son watched the incident, and reported to lawyers. The project has catalogued incidents of violence and human rights abuses for the last eight years, and Ms Mukoko ran a network of hundreds of monitors throughout the country who provided detailed and reliable accounts of the campaigns of brutality carried out by the government under Mr Mugabe. She is the most senior person to have been kidnapped yet. “Her work was extremely valuable,” said a human rights activist who asked not to be named. “Thanks to the Peace Project, there is now a detailed record of thousands of incidents of murder, assault, torture, arson and so on, and who the perpetrators are." It is the second serious kidnapping in over a month, after a suspected government hit squad seized 14 MDC activists – as well as the two year-old daughter of one of them – from the town of Banket 100 km north of Harare. Witnesses saw them being taken by police officers who have been identified. The government initially claimed they were involved in training “insurgents” against Mr Mugabe’s government, but now denies they are in official custody. The 15 have not been seen alive since they were seized 36 days ago, and police have ignored court orders for them to be produced in court. 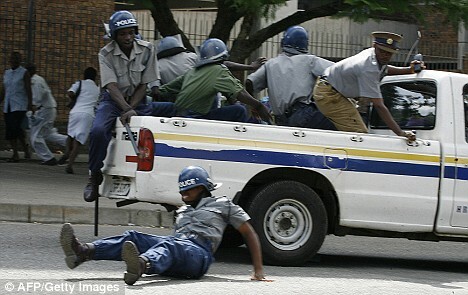 Police violently broke up separate demonstrations in Harare by the national trade union movement, demanding that the central bank lift limits on the amount people can draw from their bank accounts, and by health workers, pressing for “a safe working environment” in the midst of the country’s cholera epidemic. Thirty-eight unionists were arrested in Harare, and another 26 in other centres around the country. Baton-wielding Zimbabwean riot police broke up a demonstration by doctors and nurses protesting against the collapse of the country's health system on Wednesday, while scores of trade unionists were arrested ahead of marches over the cash crisis. The country's economy has been collapsing for several years, but now appears to have reached a stage where hardly a day passes without some new example of the consequences. With the country in the grip of a cholera epidemic, which the United Nations said today had now killed 565 people, doctors, nurses and health workers tried to present a petition at the health ministry. But they were forcibly dispersed by the riot squad, who are well-treated by the regime and remain steadfastly loyal. Three journalists, two from the Zimababwean weekly, The Independent, and one from the South African Broadcasting Corporation, were arrested as the demonstrations began. In a protest letter the medical personnel said: "We are forced to work without basic health institutional needs like drugs, adequate water and sanitation, safe clothing gear, medical equipment and basic support services. "Health workers can no longer afford to buy food and other basic goods and services." Efforts by trade unionists holding a general strike to mount protests against the cash shortage that is crippling daily activities were also broken up, after the authorities signalled several times that they would not be tolerated. The secretary-general of the Zimbabwe Congress of Trade Unions, Wellington Chibebe, was arrested while addressing workers in the capital, along with nine other people, the organisation said in a statement, while more than 30 were held around the country. It said 10 of its members were "heavily assaulted" by police in Harare. Hyperinflation is raging in Zimbabwe, with the official figure for July, the latest available, at 231 million per cent and independent estimates far higher. The phenomenon means money becomes worthless within days of being earned or paid, leading to vast queues at banks as people try to access their funds, but at the same time there are not enough notes to go around. In an attempt to tackle the shortage of money, the authorities announced that three new banknotes would be issued, with the biggest, the 100 million zimbabwe dollar bill, 100 times larger that the current maximum. Having cut 13 zeros off the currency in the last three years, the new note is worth one sextillion original Zimbabwe dollars – one of which, at independence, was worth more than the American dollar. In recent days soldiers have gone on rampages after being unable to obtain their earnings, attacking black-market currency dealers and looting shops, and on one occasion being fired upon by riot police. The authorities revealed that the incidents had been more widespread than previously thought, with the defence minister Sidney Sekeramayi telling the official Herald newspaper: "A number of properties were damaged, innocent people injured, money and property stolen. These acts are unacceptable, deplorable, reprehensible and criminal." In a sign that Mr Mugabe's government is more concerned by the development than it might want to admit, he added: "The coincidence of the above-stated incidents and the call for a nationwide stayaway and demonstrations raises a lot of questions." were severely assaulted by the increasingly militant police. their banks on Wednesday to demand their money. release them. The police said they will deal with the matter tomorrow. at a local police station. The lawyer is still negotiating with the police. Thursday morning, to discuss the issue of cash withdrawal limit. Mirriam Katumba the Vice Chair Women's Advisory Council. building - Magnet House on the 4th Floor in Bulawayo. rights abuses perpetrated around the country. state television, warning the ZCTU against holding any demonstrations. when even the backs cannot give you your money?" implementation of the power-sharing deal between ZANU PF and the two MDCs. actions on the ground undermine their commitment on paper." to close down last month because there was no water in the building. a water bowser, so that the business of governance can take place? documenting human rights violations in Zimbabwe. a South African broadcaster, have also been arrested in Harare today. Borght, Amnesty International's Africa programme director. did not have registration plates. drop of daily price increases of basic goods fuelled by hyperinflation. "unruly elements from the defence forces." envied health infrastructure is in a state of near collapse. the ZCTU as they addressed the people at a local bank along First Street. in authority to address the plight of Zimbabweans. 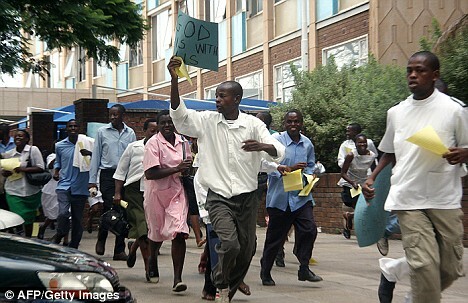 Zimbabwe riot police charged protesting doctors, nurses and union members with batons early today. At least one hundred doctors and nurses protested outside the health ministry in the capital of Harare as the country faced the worst cholera crisis in its history. 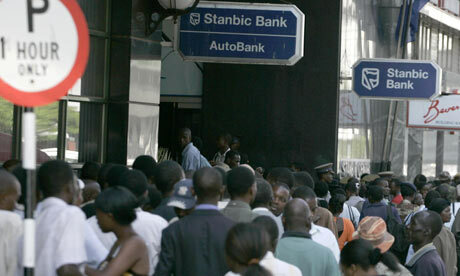 Zimbabwean trade unions have also called a day of protest over a deepening banking and cash shortage crisis. The latest death toll from the disease was put at 565, with the UN claiming that up to 12,546 people were suspected of being infected. Under normal circumstances, cholera is both preventable and treatable - but in Zimbabwe, with electricity shut off on a regular basis and Harare running out of clean water, the situation is spiralling. Now even the Limpopo River, bordering South Africa, is infected, the BBC has reported. Yesterday, as children played near cesspools, their parents shook their heads at a public service announcement drifting over the radio: It urged people to boil water before drinking it. It sounded like a taunt in the country where water and electricity are cut off far more than they are on. Authorities turned off the taps in Zimbabwe's capital again this week because they had run out of purifying chemicals in the midst of the killer epidemic. The water was turned on in Harare again today. The crisis is the latest chapter in the collapse of this once-vibrant nation. President Robert Mugabe, who has ruled for 28 years, has refused to leave office even though he and his party lost elections in March. An agreement to form a unity government with the opposition has been deadlocked for weeks over how to share Cabinet posts. In the township of Mabvuku, where residents have dug shallow wells in open ground, people say they know that not boiling the water can make them sick, but they have no choice. There is no electricity, and wood, charcoal or other fuel to build fires is scarce and so expensive it is out of reach for most people. "We are afraid, but there is no solution. Most of the time the electricity is not available so we just use the water," one resident, Naison Chakwicha, said. In the western Harare suburb of Mbare, Anna Marimbe said she had traced the deaths last week of two neighbour children to the stinking open drains where they used to play. Residents of Chitungwiza, a densely populated township 15 miles (24 kilometres) south of Harare, sued the National Water Authority last week, saying they had been without running water for 13 months, causing an outbreak of cholera and leading to deaths. The lawsuit filed with the High Court describes "large pools of raw sewage" in the streets of the town of 500,000, where the first cholera cases were reported in August. Like most of Zimbabwe's main cities and towns, Chitungwiza once had functioning sewage and water delivery systems, but authorities have made no repairs for years. Harare is the epicentre of the cholera epidemic, which has spread across the country. Controlling the disease depends on providing clean water, which means repairing broken water and sewage pipes as well as dilapidated pumping and purification equipment. And the collapse of all services, including refuse collection, has turned the city into a playground for rats that threaten to spread other more deadly diseases. The government has reported 473 cholera deaths since August and a total of 11,700 people infected as of Monday, according to Paul Garwood, spokesman for Health Action and Crises, the humanitarian arm of the U.N. World Health Organization. Garwood said that according to the official toll, four per cent of people are dying of a disease that usually claims fewer than one per cent of those infected and is easily treated with rehydration salts or an intravenous drip. Doctors say the death toll is nearer 1,000, or 10 per cent of victims, because many of those afflicted with cholera die at home or in the countryside without medical care. All the country's main public hospitals have closed and those that continue to operate have little or no medicine and suffer from a shortage of staff, whose monthly salaries do not cover even one day's bus fare to get to work. Costly private clinics, which accept only foreign currency, are out of reach for the vast majority of the population. The opposition-controlled Harare City Council is burying cholera victims for free because people cannot afford to buy graves. Zimbabwe's government, normally hostile to international aid agencies, is welcoming an initiative by several - including UNICEF, WHO and Doctors Without Borders - to provide emergency care and try to ensure safe water supplies. Health officials, following the line of a government that has refused to declare a national emergency, insisted the cholera outbreak was under control until five days ago. The best advice Health Minister David Parirenyatwa could offer was to urge people to stop shaking hands. "I want to stress the issue of shaking hands. Although it's part of our tradition to shake hands, it's high time people stopped shaking hands," he told state-run daily, The Herald. Still, Zimbabweans continue to find ways to deal with the crisis. Those who can afford it are digging wells and bore holes. Others are buying tanks and pumps to install on their roof or yards, then paying $50 in foreign currency for a single delivery of 500 gallons (1,900 litres) of water. Most vendors in Zimbabwe only accept U.S. dollars or South African rand since the Zimbabwe dollar, once on a par with the greenback, devalues with each passing hour. Yesterday, it was trading for 1.8 million to the dollar - even after the Central Bank dropped 10 zeros from the local currency this year in an attempt to keep up with inflation last set officially at 231 million per cent in July. The economic collapse of what was once a regional bread basket followed Mugabe's often-violent campaign, beginning in 2000, to seize white-owned farms and hand them over to veterans of his guerrilla war against white minority rule. Now, even those who have the money often can't buy water. One supplier said yesterday that he has a waiting list more than two weeks long. Those without foreign currency must turn to "water Samaritans" - residents of Harare's wealthier neighbourhoods who have wells or bore holes and are allowing people to fill buckets and jerry cans for free. Some residents are charging for the privilege. Lines of mainly women and children gather daily outside the homes of people with wells. But even that supply is not assured. Parirenyatwa, the health minister, voiced the fears of many when he said the cholera epidemic is likely to only get worse with the onset of the rainy season, which began last month and brings the heaviest rains in late December and January. "What I am afraid of is that now that the rainy season has come, all the feces lying in the bushes will be washed into shallow wells and contaminate the water," he said. Lovemore Matombo along Harare's First Street in the morning. petition to Reserve Bank of Zimbabwe (RBZ) governor, Gideon Gono. the RBZ Along Samora Machel Avenue in the city centre. had been abducted by suspected CIO agents at around 5am. as people shied away from most banks, fearing a crackdown by the police. queues which had potential to become flashpoints of the protest. "It is unusually quiet," said a bank teller in one of the commercial banks. limits of up to $100 million come into effect." Madzimure, the editor of The Worker, a weekly tabloid published by the ZCTU. secretary general of the Construction Union. 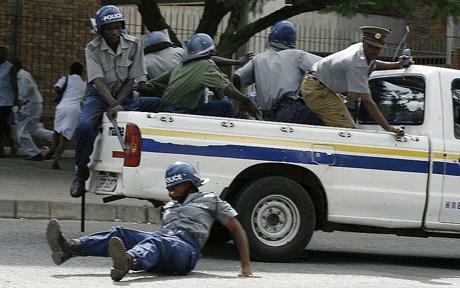 police say they did not sanction," said Moyo. arrests saying more than 20 people were arrested over the strike. respective banks Wednesday to demand payment of all their monies. they have billions in their accounts. offloaded into the illegal but lucrative black market everyday. Until now the central bank has not owned up to being the source of the cash. seemed to be employing strict security measures as a precaution. banking hall at any given time. policemen, Amnesty International said today. Harare, and took her by force while still barefoot and dressed in pyjamas. cars, one of which did not have registration plates. workmates, according to the same eyewitness. compiled through a network of community based human rights defenders. made to pay a fine of Z$20 and released on Saturday 29 November. horror he had witnessed first-hand. go and die at home," he said. become a place of death." troubled homeland twice recently after a three-year absence. for them to die at home than here." sure to die due to lack of medicine. cleaned as the city did not have water. the body as it was in a "mess". wash the body but they refused, as that would bring cholera." disease which has claimed hundreds of lives. is no water, even in affluent areas," he said. civilians to overthrow President Robert Mugabe's government. paid and they are frustrated, he said. and turn the tables on Mugabe. journalist describe life in a dysfunctional country. branches of the opposition Movement for Democratic Change - will meet again. which is intended to put Zimbabwe back on its feet. Zimbabweans live below the poverty line. basic infrastructure, a cholera epidemic has broken out. Dr Mawere works with the Zimbabwe Association of Doctors for Human Rights. public health system, your water and sanitation systems have all collapsed." Schools, hospitals, factories and government institutions have closed. living conditions are the prime movers behind the urge to leave. and again at the weekend, they rioted and looted in the capital Harare. "You have a government that is apparently unable to pay its own soldiers. govern anything resembling a country at all. do except sit around and wait for the inevitable. this morning explained the horrific conditions being found in Zimbabwe. carcasses with anthrax, their plight long past desperate. As "Sarah"
playing havoc with their efforts. need more financial backing to help a whole lot more in desperate need. power. The question is what are they waiting for? economy in a vast variety of ways extensively covered in this blog. cover up cholera while anthrax is starting to rear its ugly head. which way you look at it. from a health hazard like Zimbabwe the concern has to be that much greater.
. Despite losing the election he demands the right to govern.
. Where the economy has failed he prints worthless banknotes.
. In response to diseases he tries to cover them up.
. Where soldiers start to rebel he prepares to "deal" with them.
. Whenever he is turned loose on the press he lambastes Britain and the USA. (along with everyone else) by Mugabe. thing he cares about is his right to continue doing so. Zimbabwe and Africa desperately need to be free of him. Robert Mugabe and the opposition Movement for Democratic Change. capital Harare and beat foreign currency dealers. Cholera is spreading because Zimbabwe's infrastructure is collapsing. This has forced people to dig shallow wells in open ground. and no wood or charcoal to build fires. 12,546 people infected as of Monday, according to the UN. with cholera die at home or in the countryside without medical care. salaries do not cover even one day's bus fare to get to work. because people cannot afford to buy graves. people to stop shaking hands. governed the nation since independence from Britain in 1980.
estimated at 231 million per cent. pregnant and stricken with cholera. on Wednesday. Doctors in Zimbabwe, however, say more than 1,000 have died. The U.N. says about 12,000 more people are suspected to be infected. sick, some brought in by wheelbarrow or cart. Matewe and her unborn child, but only time will tell if they are successful. bathroom can easily pass on the bacteria that live in human feces. Sibanda, a human rights activist. "This situation here, if allowed to carry on indefinitely, will explode." the biggest anthrax outbreak since the one in 1979-80.
and other forms of relief into the country. hospital alone has recorded more than 362 deaths. to help in the town. Zimbabweans do not enter their countries. Zimbabwe is not to bring down the whole of Southern Africa. 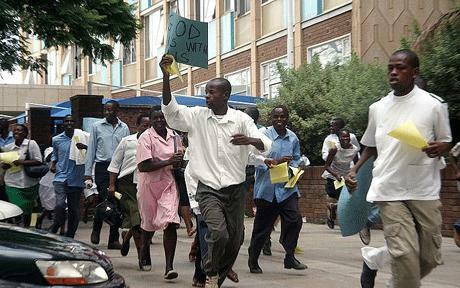 NCA peaceful protest in Harare tomorrow, 4 December 2008.
restore normalcy to other aspects of our national life. People's Charter. The process must end with a referendum. installed. The elections must be internationally supervised and monitored. riot in the capital city of Harare on Monday. people and looted shops, the first such incident in the country. impose limits on cash withdrawals. money changers, and later looted goods from shops. outbreak which has so far claimed more than 400 lives across the country. and within the government in particular. Mugabe's rule over the economic hardships. workers struggled to withdraw their pay from banks. worthless due to shortages of basic goods. deplorable, reprehensible and criminal," said Sekeramayi. secret service and police, underlining the gravity of the incident. including those suspected of inciting the riots, would be harshly punished. The long-serving Zimbabwean leader was expected back home Wednesday. feeling the heat of the country's collapsing economy. opposition, putting the country's shattered economy on the road to recovery. the loyalty of the army to keep the opposition in check. the capital as dissident soldiers and military police clash. empty-handed after cash had run out due to rationing. currency dealers and seizing cash from them to demand "our money". Then they swept across the city, looting and vandalising shops. black market and relies on an informal network of street traders. the death of "two miscreants", according to the army. has maintained a heavy deployment of military police in the city centre. "We need to take appropriate measures to counter their actions effectively,"
in the army with nothing. Zimbabwe dollars a day, hardly enough for a single fare on public transport. meal mush) and beans only. during the December 1 protests. through this impoverished nation of 11.8 million people. since disputed elections held in March. Harare-based political commentator Ronald Shumba. deep-seated problem in the army - in Mugabe's regime, in fact." was a simple case of "theft and robbery". party and the increasingly disaffected army, police and security forces. present the clearest threats to his rule. that ended white rule in 1980, according to a private in the army. 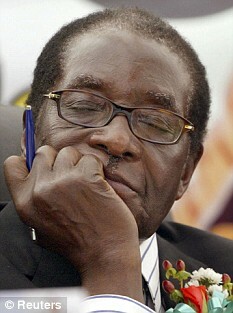 President Mugabe himself for causing the hardships. He was unwilling to be identified for fear of reprisal. than a handful of goods. cent and picking up speed. in the security forces opened the possibility of a coup. is responsible for the protests. suggesting it's a precursor to a coup is pie in the sky," he said. army, which used to be considered solidly loyal to the president. contain this. But you can't blame the soldiers." new banknotes Wednesday, including a 100-million-dollar bill. and promised the culprits would be punished. elements from the defence forces," he said late Tuesday. money and property stolen," he added. are being investigated and those culpable would be brought to book." soldiers of having carried off goods. and taking goods away. Police were called to break up the riot. country where local bank notes lose value by the hour. deliver their petition to the authorities. and basic support services," their protest letter said. as the authorities struggle to contain the epidemic. to issue the first 100-million-dollar notes. correspondent at the scene reported. one-hundred-million-dollar note, state media reported Wednesday. and a million dollars respectively, The Herald said. The new notes will come into circulation on Thursday. estimated at 231 million percent in July. investigations and owed to take strong measures against junior soldiers. police and several were arrested. rampaging soldiers was then unprecedented. stopped reporting for duty. Mass desertions are likely to follow. did not want to be named. banks because of a cash shortage. soldiers are being asked to bring food from home. they had looted in the city. with a pitched battle against riot police. recommended to impose the death penalty on the soldiers involved. "There is a general fear in government of another Somalia here in Zimbabwe,"
actions as "unacceptable, deplorable, reprehensible and criminal." agency, the Central Intelligence Organisation (CIO). vehicles involved in the abduction was a grey Mazda 325 Familia. nor wife can be found. was broken up before it reached the Central Bank. own military establishment, can total anarchy be far away? allow President Robert Mugabe to declare a state of emergency. deepening cash shortages and the economic crisis. withdrawal limits imposed by the central bank. as part of the protests. within the context and confines of the laws of this country." currency dealers, was targeting his opponents. as they ran amok on the streets, critics said. influence security forces to revolt against the government. threatening to sweep it away. on record saying the bombings were an inside job. September 15 power sharing agreement. indication that the centre can no longer hold. long-time clamour for change,' Mutsekwa said. little public support during the disturbances. the same stark deprivations that have cut across Zimbabwean society. it doesn't take any prisoners, they all go down,' Mutsekwa said. issues that caused the problem. culprits but glaringly missed to say why the soldiers acted in that manner. The Zimbabwe government is set to greatly increase the amount of money people can withdraw from banks from tomorrow in an attempt to quell growing unrest, including riots and looting by soldiers this week, over a drastic cash shortage caused by hyperinflation. The central bank has raised the withdrawal limit from the equivalent of just 18p a day to about £33 a week following the protests in which scores of troops apparently angry at waiting in long bank queues targeted shops in Harare that will only accept payment in US dollars and blackmarket money changers openly dealing on the streets. The growing anger among soldiers and other Zimbabweans is due in part to the increasing difficulty of using the national currency to buy anything but a few locally produced vegetables and bread after the US dollar was made legal tender. The central bank is also issuing new Zimbabwe dollar bank notes tomorrow worth Z$50m (£17) and Z$100m to keep pace with inflation officially put at 231m% in July but which economists now estimate runs in to the billions. Riot police today arrested trade union leaders and broke up a small protest over the limits on cash withdrawals. The union leaders were detained as they led a march of a few dozen people to deliver a petition to the central bank demanding an end to the restrictions. The demonstrators carried placards reading "No to cash limits" and "We are tired of sleeping at the banks" because many people spend hours queuing every day just to get enough money to cover transport and a few basic foodstuffs. The police today also broke up a protest by doctors and nurses attempting to deliver a petition to the health ministry in Harare objecting to the lack of medical supplies and the closure of some large government hospitals. "We are forced to work without basic health institutional needs like drugs, adequate water and sanitation, safe clothing gear, medical equipment and basic support services," the letter said. 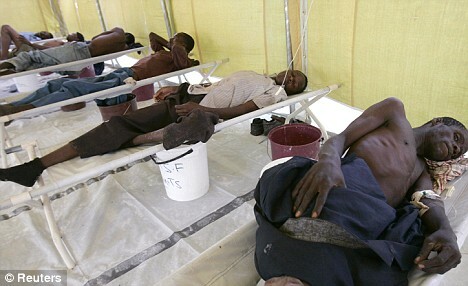 The collapsing health service is now grappling with the additional burden of cholera. The UN said today that it had confirmed 565 deaths from cholera among 12,546 reported cases but medical charities say the real toll is at least double. One-third of the deaths were in the capital, Harare, where water has been cut off for days because of a lack of chemicals to treat the supply. The government said it will punish troops involved in the protests but some of Mugabe's critics suspect the demonstrations may have been orchestrated to justify a further crackdown on his opponents and possibly the introduction of a state of emergency. The former home affairs minister Dumiso Dabengwa, who has joined a breakaway faction from Mugabe's Zanu-PF party, told the IRIN news service that the protests may not be what they seem. "I do hope the demonstrations by the soldiers are genuine, and that it is not a ruse to come up with an excuse to crack down against the people, or even worse," he said. "You can't rule out what they [the government] might do. They have so many problems ... such as cholera and money shortages. They want to rule a country where they have total control over the people. Anything is possible - they face so many problems that I don't rule out any move to contain the situation." Suspicion is rife because the government has sought to retain the backing of the army by ensuring that banks regularly delivered cash to the barracks. However, the troops still have much to be disgruntled about. The central bank is issuing the new bank notes tomorrow as the national currency continues its interminable decline. A new Zimbabwe dollar was launched in August after 10 zeros were wiped off the currency because banks and shops could no longer handle the numbers. But the new dollar has plummeted just as fast, falling from about Z$10 to the pound in early August to Z$3m today for cash. Twenty-seven new currency denominations have been introduced in Zimbabwe this year alone. The rioting soldiers told bystanders they were angry that what little money they have can be used for little more than paying for transport and buying a few of the sparse locally produced goods. The government caught up with reality by legalising the use of US dollars and other hard currency in September. Dollars and South African rand were already in widespread use in what amounted to underground supermarkets selling imports. Now the transactions are legal, it is almost impossible to buy anything in Zimbabwe dollars. The Spar in Ballantyne Park, in northern Harare, is used by middle-class Zimbabweans and their domestic workers. It prices almost everything in US dollars and will accept payments only in the American currency, rand or sterling. Change is given in bread rolls because of a shortage of small foreign notes. Only locally produced vegetables, eggs and bread can be paid for in Zimbabwe dollars. scrapping of the central bank's unpopular cash withdrawal limits. central bank's cash limits Wednesday. concerned with the failure by Zimbabweans to access their cash. through which the cash crisis can be addressed." but later rescinded his decision for security reasons. million, up from $1 million. another new set of bank notes - $10 million, $50 million and $100 million. violently broke Wednesday's strike in the city centre. Harare were later released without any charge. frantically working to have then released. (CIO). The men were driving a Mazda Familia car without registration plates. taken away still wearing her nightdress. for the state-owned Zimbabwe Broadcasting Corporation. opposed to continued ZANU PF control of Zimbabwe's security ministries. and say prices are doubling daily. not at war, according to the World Bank. 2005. Since then, the situation has only worsened. this would decline to 9.9 percent in 2007. Once the breadbasket of southern Africa, Zimbabwe now needs to import maize. 2000 to just over 74 in 2005.
national demand of 2 million tonnes. need food aid by early 2009. IMF has suspended financial and technical assistance. 2005 from 76 deaths in 1990.
of Humanitarian Affairs in Zimbabwe. week in the country of 13.3 million. emigration rather than prevention measures. killed three people and could wipe out at least 60,000 livestock. is completely lawless. The land is wet, but the crops are not planted. uniting struggle. The people have had enough, they have nothing. to attend. The hard-earned money from the Diaspora will be spent on coffins. they need to save their lives. Tsvangirai's calls of patience but at such a high price. person's chances of survival you can help by giving them rehydration fluid. What are Zim's options now? and by clashes earlier this week between Zimbabweans and angry soldiers. with batons, the weight of despair is clearly growing. inflation. With exports collapsing, there is nothing to back the currency. potentially be a threat to the government as well as to public order. The clock is certainly ticking on chances for the power-sharing deal. will be another two weeks before it is even discussed again. obstacle, but there is no sign yet that either he or Mugabe will budge. donors and investors want. Tsvangirai promises free-market policies. turmoil means Zimbabwe is not a top issue and funds are in short supply. a cabinet himself and has looked set to move in that direction. stalemate with the same risks that entails. sanctions. That could push the economy even closer total collapse. sides into a deal - symbolically putting some aid on hold.